Please help us Remember, Honor, and Teach on %December 18, 2019% 10am by sponsoring a wreath, volunteering, or inviting friends to help. 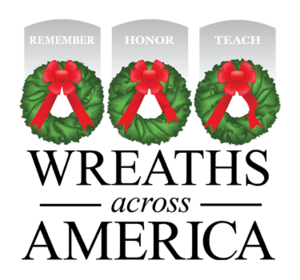 Please help us Remember, Honor, and Teach on December 18 by sponsoring a wreath, volunteering, or inviting friends to help. Sponsorship is NOT necessary to attend the ceremony. For all the years of great cards, Watson's, and special memories... we salute you, Gene D. Watson! In memory of my Dad and Mom, together again. Check out 68 "Remember" recent messages from our supporters. Click "View Remember Wall" to see them all. We are happy that you are willing to help with our Wreath Across America ceremony at Arizona National Memorial Cemetery. Please do not forget to register to volunteer! That way you will get all updates about the cemetery itself. Welcome to Wal Mart Transportation Centers 6831 & 7813 (AZ0003)! Our location fundraising group is proud to support National Memorial Cemetery of Arizona and to help honor and remember as many veterans as possible. Please click "View" to learn more about our effort and then click "Volunteer" to join us for National Wreaths Across America Day. Thank you so much! Welcome to Phoenix National Memorial Cemetery! Our location fundraising group is proud to support Arizona national Memorial Cemetery and to help honor and remember as many veterans as possible. Please click "View" to learn more about our effort and then click "Volunteer" to join us for the wreath laying ceremony planned for 10 am on December 18. Thank you so much! 43 groups support us. Click "View Our Groups" to see them all.